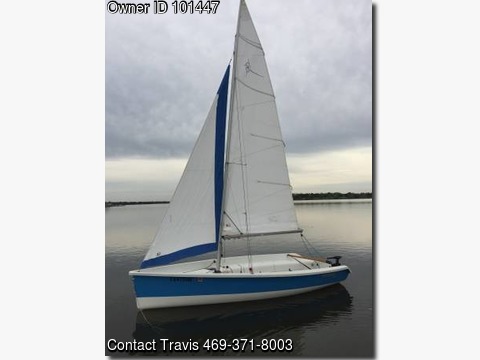 Boat is located in Dallas,Texas.Please contact the owner @ 469-371-8003...2003 Blue Vanguard Nomad 17 Sailboat in Excellent condition Boat has tons of upgrades and has been very well taken care of. Trailer included Northsail main sail 2 years old Custom jib with matching blue weather protectant strip 2 years old Original asymmetric spinnaker Spinnaker pole (not pictured) 2 optional zip in sail floats 32" Battlestick tiller extension Custom white delrin motor mount to match hull New electric minnkota 50 lb thrust motor 1 year old AGM 12V battery 1 year old Boarding ladder Paddles Docking bumpers Seat cushions Many other hardware additions including upgraded jib roller furling and new pulleys throughout. Cover included and useable but needs zipper repair / replacement.